Primary Open Angle Glaucoma (POAG) is a common neurodegenerative disease characterized by the selective and gradual loss of retinal ganglion cells (RGCs). Aging and increased intraocular pressure (IOP) are glaucoma risk factors; nevertheless patients deteriorate at all levels of IOP, implying other causative factors. Recent evidence presents mitochondrial oxidative phosphorylation (OXPHOS) complex-I impairments in POAG. Leber Hereditary Optic Neuropathy (LHON) patients suffer specific and rapid loss of RGCs, predominantly in young adult males, due to complex-I mutations in the mitochondrial genome. This study directly compares the degree of OXPHOS impairment in POAG and LHON patients, testing the hypothesis that the milder clinical disease in POAG is due to a milder complex-I impairment. To assess overall mitochondrial capacity, cells can be forced to produce ATP primarily from mitochondrial OXPHOS by switching the media carbon source to galactose. Under these conditions POAG lymphoblasts grew 1.47 times slower than controls, whilst LHON lymphoblasts demonstrated a greater degree of growth impairment (2.35 times slower). Complex-I enzyme specific activity was reduced by 18% in POAG lymphoblasts and by 29% in LHON lymphoblasts. We also assessed complex-I ATP synthesis, which was 19% decreased in POAG patients and 17% decreased in LHON patients. This study demonstrates both POAG and LHON lymphoblasts have impaired complex-I, and in the majority of aspects the functional defects in POAG were milder than LHON, which could reflect the milder disease development of POAG. 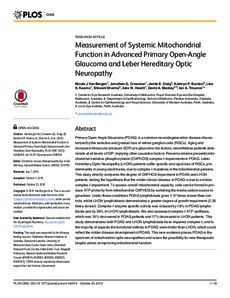 This new evidence places POAG in the spectrum of mitochondrial optic neuropathies and raises the possibility for new therapeutic targets aimed at improving mitochondrial function.